‘Tis the season for graduations, confirmations, and outside celebrations! The patio furniture is out, the mulch is spread, and we’re ready for cookouts. I almost always offer to bring an appetizer or dessert, because I like “snacky” food, and it gives me a chance to try one of the millions of appetizer and dessert recipes that I am constantly clipping or pinning. You see, in my imaginary life, I have thousands of cookouts, cocktail parties and family gatherings to attend, which is why I save all those recipes. My real life, however, isn’t really like that, so just the thought of making a new appetizer or dessert sometimes makes me giddy with excitement. 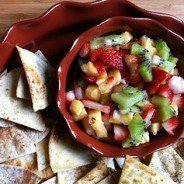 Fruit salsa is one of those recipes that can go either way – appetizer OR dessert. It’s a nice twist on the traditional fruit salad, and (bonus) it’s quick and easy to throw together just before you leave for the party. Of course, it’s also a healthy choice, so no one has to feel guilty about going back for seconds. Or thirds. If making this ahead of time, keep the chips in an airtight container, and chop and blend the fruit, but don’t add the jelly/sugar mixture until just before serving. Use hot pepper jelly if you want more of a spicy kick. It sounds Delicious!! Like your recipe and I should try this. This was really a great post. This step by step guideline will really make it easy for me. Thanks for shearing this.